A couple of weeks ago I surprised my family with a new dessert that out to be a big hit! 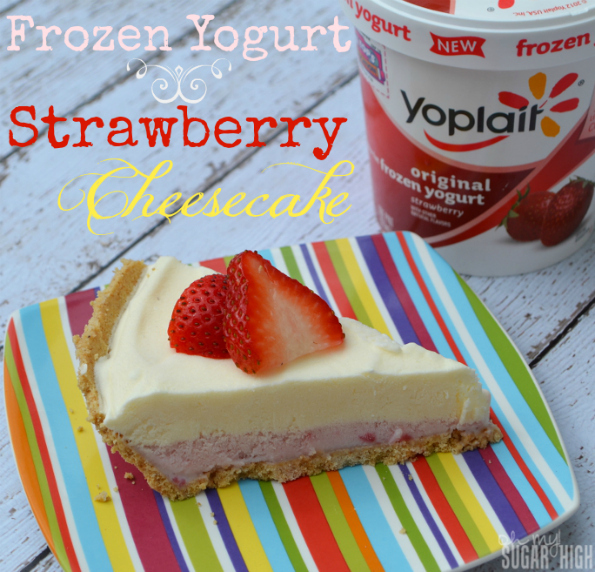 I was challenged by General Mills to come up with a recipe using their new Yoplait Frozen Yogurt. Cheesecake happens to be a favorite dessert of mine but it is anything but healthy. I decided to create a fun strawberry cheesecake inspired dessert that doesn’t make me feel so guilty while enjoying dessert. And this one is refreshing as well, perfect for a hot summer day. After trying this, my boys gave it two enthusiastic thumbs up, my 5 year old even declaring that it gets a billion thumbs up. (That is a lot of thumbs!) And even better, this pie is only 214 calories per serving. The fat content is 8 grams per serving but a majority of that is the graham cracker crust. You could reduce the calorie and fat content by using fat free whipped topping, skim milk or a reduced fat graham cracker crust. You could even try it with no crust at all if you prefer which would drop this down to under 100 calories and 2 grams of fat per serving! 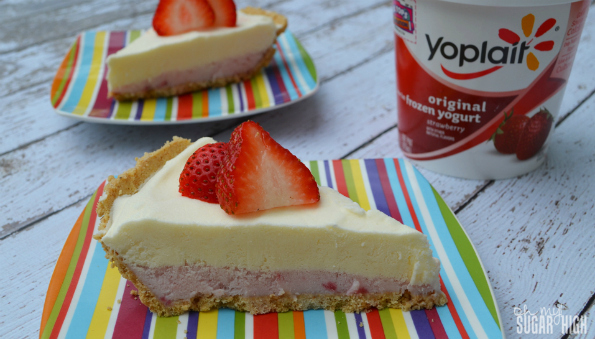 Spread softened frozen yogurt in graham cracker crust. Meanwhile, prepare pudding using pudding mix and milk. Whisk for two minutes, or until well blended. Let sit for 5 minutes to set. Spread pudding mixture gently over frozen yogurt. Cover and freeze 4-6 hours or until solid. Garnish with fresh strawberry slices if desired. Serve immediately and return any remaining pie to the freezer. You can easily change up this recipe using various flavors of frozen yogurt or pudding. For example, blueberry yogurt with vanilla pudding or cherry orchard frozen yogurt with chocolate pudding. 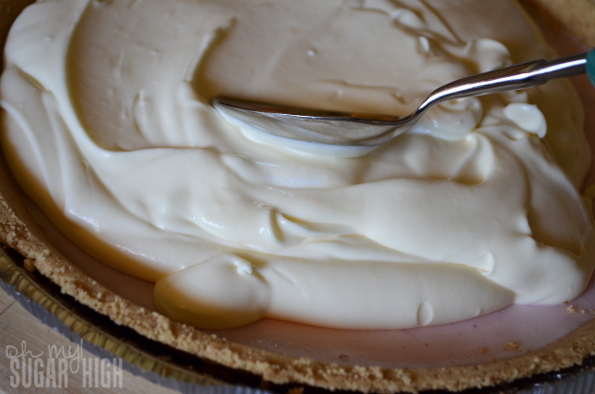 Substitute a 6 oz graham cracker crust for a thicker pie. Use a reduced fat version to save on the extra calories. 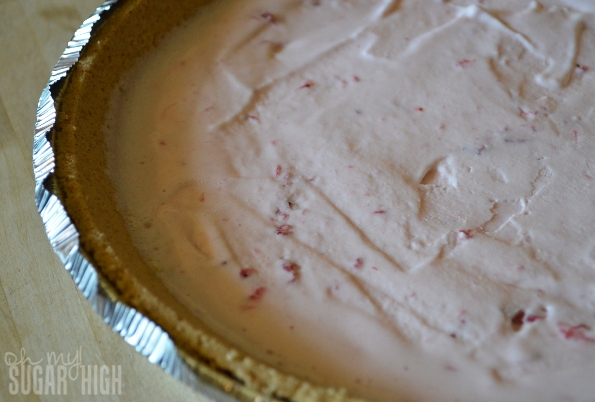 For an even lighter pie, use fat free whipped topping and skim milk. Hi Emile just thought I’d give you a heads up Someone on instagram is claiming the name “oh my sugar high” also as their buisness name. Thanks for the heads up! I really appreciate you taking the time to let me know and I’ll be looking into it!